These tender and tasty Dijon chicken skewers are family-friendly and perfect for a big party or a quick weeknight dinner. With no need to marinade and being baked in the oven, these skewers come together in less than 30 minutes. When it comes to summertime foodie favorites, the only disadvantage is that they tend to only come around in, well, summer. So I’m always thrilled when I find a summer classic that 1) can be baked in the oven (so no need for fair-weather grilling) and 2) is also family-friendly enough to make for a big party or a weeknight dinner. And, you guys, that’s exactly what these baked dijon chicken skewers are. Easy to make, baked in the oven, and breaded for crowd-pleasing appeal. They’re like delicious chicken nuggets baked on a stick and it’s genius. Do you have to marinade the chicken? Nope! 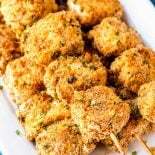 These skewers get their flavor from a thick Dijon mustard coating and lots of breading. The flavor is baked into the outside of the chicken, so there’s no need to marinade. What kind of skewers should you use? For this recipe, you can either use metal skewers (I have a set similar to these) or you can use wooden bamboo skewers. However, I tend to prefer using the bamboo skewers for easier cleanup and a more classic look. And the trick with using bamboo skewers is that you should soak them in water first. In a long, shallow dish, fill with about 1/4 inch water. Arrange the skewers in the water. Let them soak for a minimum of 20 minutes, or ideally a maximum of three to four hours. Pat skewers dry, then thread on the meat. Step 1 – In a medium bowl, add Dijon mustard and chopped green onion, then mix very well. Set the bowl nearby. Step 2 – In another small bowl, add the breadcrumbs and the parsley, then toss to mix. Set this bowl nearby as well. Step 3 – To prepare the chicken skewers, dip a piece of chicken (cut into one inch cube) in the Dijon mixture, tossing well to coat. I personally like to coat them heavily for more flavor, but use as much or as little as you like. Next, take the Dijon coated chicken and toss it in the bowl with the breading. And like the Dijon, coat the chicken as much or as little as you like (I used a lot of breading). Once the chicken is nice and coated, thread it on a metal or wooden skewer. Keep working this step until all the chicken is coated and threaded on the skewers. In general, each skewer should hold about six to eight pieces of chicken, leaving room at each end for holding. Step 4 – Place the prepared skewers on an aluminum foil lined baking sheet. It’s okay to place them close together, so long as they’re not directly touching. Step 5 – Bake the skewers. Can you grill these instead? Given how thick and crumbly the breading is for this recipe, I can’t recommend tossing these skewers on the grill. The breading will likely fall off or stick to the grill while cooking, making a big mess to clean up. The only way around this would be to wrap the skewers in foil, but doing that might defeat the whole reason you’re heating up the grill. As mentioned above, you can use either metal skewers or bamboo skewers. If using wooden skewers, see above for how to soak them before baking. When picking your breadcrumbs, you can use original OR you can pick a flavor that compliments Dijon mustard (such as Italian). You can also use panko breadcrumbs instead. Preheat oven to 450 degrees F. Line a baking sheet with aluminum foil, then set aside. In a medium bowl, mix together Dijon mustard and green onion. Set nearby. In another medium bowl, mix together bread crumbs and fresh parsley. Set nearby. To prepare chicken: coat a cube of chicken in the dijon mustard mixture, then toss to coat it in breadcrumbs. Thread the chicken on a metal or water-soaked wooden skewers (see text above for how to soak skewers). Repeat this step until all the chicken has been coated and skewered, leaving room at both ends of the skewer for handling. Place finished skewers on prepared baking sheet. When finished, discard any remaining Dijon mustard or breading mixture. Tip: a skewer should be able to hold anywhere from 6-8 pieces of chicken. Serve Dijon chicken skewers immediately.